Moselle Avenue in north London. POLICE IN NORTH London are appealing for information after a 62-year-old Irishman collapsed and died following a row with two teenagers. 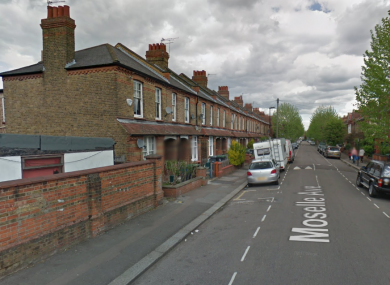 Joseph Kelly, who was originally from Tullamore, Offaly, was found unconscious outside his home in the Moselle Avenue area of north London on 12 April. Officers and the London Ambulance Service attended the scene and the 62-year-old man was taken to a north London hospital where he later died. According to police, Kelly was a fitter and welder by trade. He was unmarried with no children. A post-mortem examination did not establish a definitive cause of death, but made reference to Kelly’s generally poor recent health. DCI Luke Marks, the officer leading the investigation, said: ”The death is not being treated as a homicide, however a police investigation into the circumstances of the death continues. Email “Investigation launched after Irishman dies following row with teenagers in London”. Feedback on “Investigation launched after Irishman dies following row with teenagers in London”.